Baker is a gravitationally bound system composed of four planets in orbit around its two governing stars, Baker A and B. The binary stars have drawn the attention of astrophysicists eager to study such a phenomenon. A Covalex shipping hub and a largely automated mining outpost are the primary bastions of civilization in the region. The Baker system is also home to the “Able Baker Challenge,” arguably underground racing’s most dangerous event. From a settlement-or-resources standpoint, Baker’s first three worlds were written off immediately after the system was charted. None can be terraformed in a fashion that will sustain life permanently, and none have resources that make traveling close to the system’s stars worthwhile for major corporations. While Baker’s three inner planets may be useless in any formal sense, they have taken on new life as one of the galaxy’s most dangerous unofficial racetracks where the Able Baker Challenge pits pilots against each other and the environmental dangers. Brave pilots who flew in past races had to face severe and often deadly challenges. One year saw the participants having to navigate the space that surrounds Baker III, which is filled with dangerous ice crystals that can impair instrumentation and severely hamper visibility. Another race featured a stage called ‘breathing the vapors.’ that involved ring targets placed very close to Baker II’s toxic atmosphere. Pilots had to traverse the course carefully to avoid hull damage. There have often been races that included final legs that are weapons-free. Unlike more “civilized” events, this means racers are not immediately disqualified for the destruction of an opponent’s ship (although kills are still frowned upon). This makes for one of the most dangerous competitions in the galaxy. Navigating the course is considered a badge of honor among underground racers, although official racing teams avoid the Able Baker Challenge for the most part. As it is an unofficial race organized by unknown concerns, the challenge has no rules concerning weapons or other safety procedures, and especially competitive racers have been known to gun down opponents even in early race phases in order to gain an edge. Visitors should also be aware that the underground nature of the challenge has led to a significant number of casualties among amateurs. 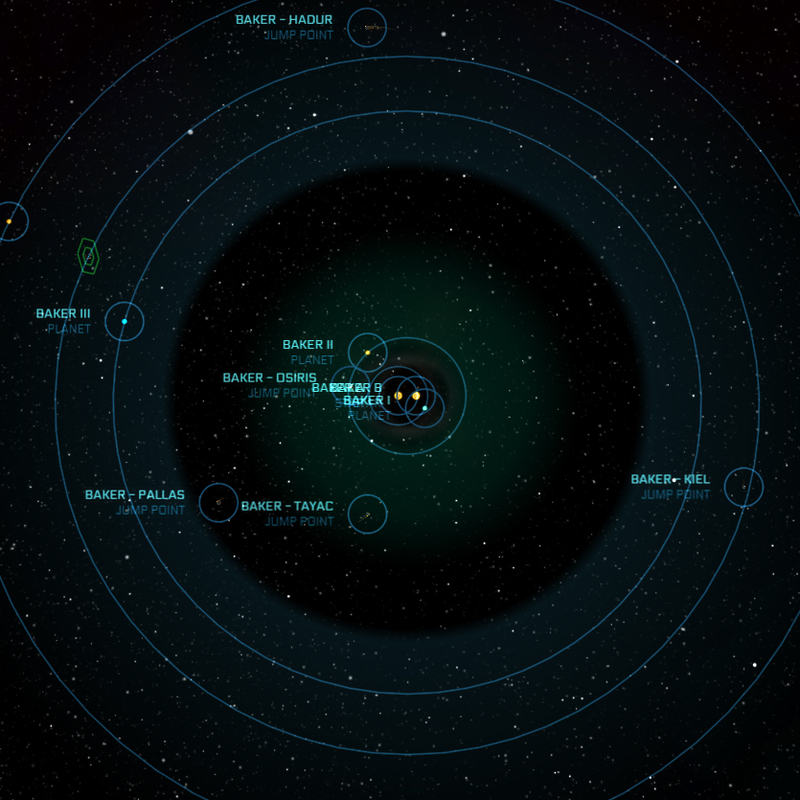 The first successful transit to Baker occurred in 2522 when the jump point to Baker was discovered by accident in the Kiel System. Baker remained relatively forgotten due to the fact that binary stars traditionally offer little of value to Humans. Even when a planet within a binary star’s green zone can be terraformed, the gravitic stress associated with passing close to (or between) two stars renders attempts at civilization a moot point. However, Baker was subsequently explored by a purely scientific expedition. With a decaying orbit bringing the small planet closer to the system's stars, Baker I is expected to collide with Baker A in approximately one hundred and fifty million years. The atmosphere of this smog planet is so extremely toxic and corrosive that it is able to rapidly dissolve most modern hull and construction materials, making approaching the world a difficult and risky proposition. There are very few landmarks on Baker IV's atmosphere-free surface beyond the Shubin Interstellar outpost GIO, from which the corporation oversees its mining operations across the planet. Operated by Covalex Shipping, the Xenia station not only serves as a major cargo transfer hub for goods heading throughout the Empire, but also houses most of the permanent population in the Baker system. Xenia's orbit lies between Baker III and Baker IV.